Book News: Battle Over Maurice Sendak's Book Collection Sparks A Lawsuit : The Two-Way The dispute centers on many of the late author's rare books, which a Philadelphia museum says are being withheld by Sendak's trustees. Also: Isaac Asimov's Foundation trilogy may be coming to HBO. 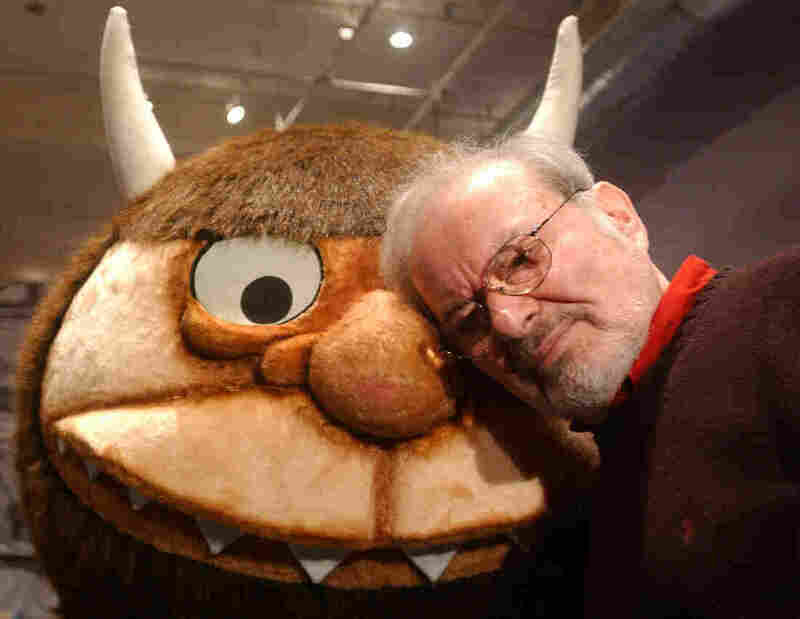 Maurice Sendak stands with a character from his book Where the Wild Things Are in 2002. In the more than two years since Maurice Sendak died, a dispute has simmered over the celebrated author and illustrator's wishes for the works he left behind. Now, the fate of that personal library will be settled in court. The Rosenbach Museum and Library in Philadelphia has filed a lawsuit against Sendak's estate, alleging that the Sendak trustees have failed to comply with the terms of his will. In the will, according to the lawsuit, Sendak requests that much of his rare book collection — as well as many of his own writings and illustrations — remain in Philadelphia to be displayed at the museum, with which Sendak shared a decades-long relationship. Although the will allows leeway for negotiation between both parties, talks between the Rosenbach and the executors of Sendak's will have failed to reach an agreement. At the heart of the dispute lies two gems of Sendak's collection, according to the Philadelphia Inquirer: William Blake's Songs of Innocence and Songs of Experience, and several books by Beatrix Potter, author of Peter Rabbit. The newspaper reports that the debate over the latter boils down to a question central in Sendak's own writing. The suit argues that the estate doesn't intend to transfer to the Potter books because "they are children's books, not rare books," the Inquirer writes. "The Rosenbach calls that reasoning not only faulty but rife with irony: Sendak argued that divisions between adult and children's literature were invalid — in his work as well as that of others." Filed in Connecticut, where Sendak lived, the lawsuit has an added wrinkle: a possible deadline. Sendak trustees are planning an auction in January. Although trustees have said none of the disputed items would be auctioned, according to the lawsuit, the Inquirer reports that the Rosenbach has nevertheless sought a court order to keep executors from transferring, disposing or distributing until a resolution is reached. Asimov on HBO: The Wrap broke the news that Isaac Asimov's Foundation trilogy will be adapted for television. The site reports that the series will be written by Oscar-nominated screenwriter Jonathan Nolan and produced by HBO and Warner Bros. TV. And while representatives from the major players involved have yet to comment on the story, this has done little to slow the Internet's volcanic reaction to the news. It Begins: Forget for a moment that it's only mid-November: With the same inexorable creep of holiday shopping commercials, the year-end "Best Of" lists have begun to unfurl already. And while we can count ourselves lucky these lists aren't quite so catchy as the standard-issue Christmas carol, still, it appears that there's already plenty of required reading on tap. Not to be outdone, Publisher's Weekly had already announced its picks for the best books of 2014 — back on Halloween. Marlon James' A Brief History of Seven Killings, Lorrie Moore's Bark and Emmanuel Carrere's Limonov tops its list of 10. On Your Marks: The National Book Foundation, GoodReads, Mashable and Penguin Random House have partnered to launch a National Readathon Day on Jan. 24, 2015. The event, which aims to raise funds for the NBF, invites people across the country to settle down with a book for a four-hour chunk, from noon to 4 p.m. that day, and to grab friends to sponsor them with donations while they do it. 'If You're Greedy, You're Set Up': Out of the archives, PBS dredged this 1970 conversation between Studs Terkel and Maya Angelou, who regaled Terkel with tales she says were told to her by con men when she was young. To Finish Or Not To Finish, That Is The: Questioning your moral obligation to finish a book you've started even if you find it dreadful? Well, so are Juliet Lapidos in The Atlantic and Peter Damien on BookRiot. Not surprisingly, they come down on different sides of the divide — but their points might help better define your own plight, as you weigh whether to keep that book open or just put it down.